Self-contained open-circuit compressed air breathing apparatus are used widely for fire-fighting, chemical industry, shipping, laboratory, mine, pertroleum, warehose, factory and metallurgy. It can provide effetely respiratory protecting from toxic gases for fire-fighting, life-saver, rescuer and operator who working in thick smoke, steam, and oxygen deficiency hazardous atmosphere. 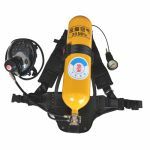 The product was awarded the certificate of inspection by state quality testing center for fire-fighting equipment, and it is up to the China standard of GA124” self-contained open-circuit compressed air breathing apparatus for fire-fighting.